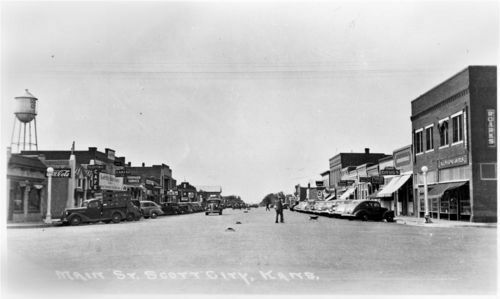 This photograph shows a view of businesses on Main Street in Scott City, Kansas. The second building from the right has a Rexall Drugs sign, and another building farther in the background on the right side of the street has a sign reading, "Drugs," beneath a Coca-Cola sign. (The drug store sign is visible just above the distinctive Western Auto sign, the curved arrow shaped like a backwards 9). Many other businesses are visible along both sides of the street. Many automobiles and a pickup truck are visible parked or driving along the street. Two people and a dog are visible crossing the street. A water tower is visible on the left side of the picture. Holding Institution: Robert Richmond, 1958.